We simply can’t get enough of Wiley Valentine! Check out these amazing invites and incredible stationery. 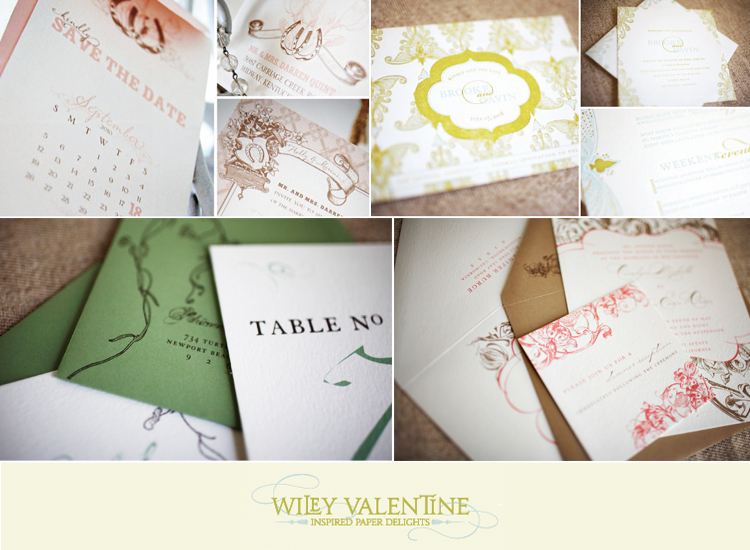 For the bride who loves letterpress and its hand made one of kind quality, Wiley Valentine offers a huge selection of fun, elegant and whimsical papers and patterns! The bridal collection is comprised of gorgeous invitations flat printed on a beautiful 100% recycled paper. If you’re looking for a way to keep your invitations environmentally conscious – their standard paper is FSC certified, 100% post consumer paper made with 100% green energy, certified processed and chlorine free. All that to say, Wiley Valentine is a 100% sustainable paper company! All of the invitations are customizable by color and font choice, which lets you add your own personal touch to the design. And check out their envelopes, with signature printing to incorporate design on the envelope too. So adorable! Wiley Valentine can be found locally at Needle in a Haystack in Dallas. Stop by today! « Previous Post: The Finishing Touch!